As the school year is getting started and your kids are getting back into their routines, this is a great time for parents to assess how your child is doing academically, socially and emotionally. This can be an exciting time but unfortunately, this time of year can bring a lot of anxiety and stress as well. Parents, do you find yourself saying “this year will be different” or “this year has to be better” because your child struggles to focus at school? Watching your child struggle in school and not reach their potential that you know they have is so hard and as a pediatric chiropractor, the phase I commonly hear is “I don’t know what’s happening with her” and “I don’t know how to help; we are tired of fighting and forcing him to do his homework.” Usually there is a daily meltdown that happens either at school or at home when your child is asked to focus and complete the task at hand. You want your child to have a great year academically, emotionally and socially and I am here to provide you with some applicable tools to make that dream a reality. First, it’s crucial that you understand what is happening with your child and why it is so hard for them to focus and use their energy productively in the first place. How does your child learn? Their brain. Your child’s brain and nervous system are constantly learning and developing; the brain is not fully developed until their mid-twenties so even when they are not “learning”, their brain is always at work making new connections and forming new neural pathways. These neural pathways are either calm, clear and connected or stressed, chaotic, and disorganized. Which pathways do you think are desirable? The calm, clear and connected ones of course! But, unfortunately, that is not often the case; your child’s neural pathways may be ones of stress, chaos and disorganization. Think of it this way, if you are trying to find your favorite radio station and the station is 97.5 and you are on 97.3, what does it sound like? Is it clear or is there static? Correct, there is static. That is exactly what is happening in your child’s brain when it is in a stressed, sympathetic aka fight or flight dominate state; the neural pathways, the communication among the brain centers and the body is fuzzy and disorganized. If your child’s neural pathways are disorganized, it will lead to disorganized behavior with the inability to focus because the pathways are literally not focused or organized. How well do you focus when there is extra static and noise in the background? Not well I assume. Neither does your child, but the difference is that the noise is not a irritating radio that you can shut off. It is inside their brain constantly that can only be shut off when the neural pathways become calm, clear and connected again. What causes this static in the first place? I have parents ask me all the time, “how does my child’s brain get stuck in this sympathetic and stressed out state?” or “why is my child stressed out, he doesn’t have to worry about work or paying the bills?”. Although that is true, our kids these days go through a tremendous amount of internal and external stress. Whenever your child has an excess of physical, chemical or emotional stressors in their life that the nervous system cannot change and adapt to, it shifts immediately into that sympathetic fight, flight or freeze state to protect itself. It’s an intelligent process but it becomes an issue when that is the only state that you child’s brain is developing in. What do I mean by a stressed, sympathetic dominant state? The part of your nervous system that you don’t consciously have to control is known as your autonomic nervous system. It’s responsible for your breath, your heart rate and your digestive system function, to name a few. The ANS has two states, the sympathetic state and the parasympathetic state. The sympathetic nervous system is also known as the fight/flight/freeze state and the parasympathetic nervous system is also known as the rest/digest/growth state. When your child is struggling to focus and on the verge of emotionally melting down, which state do you think is activated? If you said sympathetic, you are exactly right! Your child’s brain is in a stress state aka sympathetic overdrive that does not allow for the brain to be calm and connected. This causes the brain to be in a state of protection and survival and not one of growth and development. The neural pathways of sympathetic dominance become ones of stress, chaos and disorganization like we described above. The sympathetic/stress state activates the primitive centers of the brain and inhibits the neocortex and higher order brain centers where focused attention, learning and emotional regulation occur. So even when they are trying their hardest to follow directions and do their homework, their brain is literally stuck in stress mode and will not allow your child to focus and learn the way you know they are capable of. This is why they often get frustrated and make negative associations with school which have lasting effects of their entire lives. Now that you have a better understanding of what is causing your child’s inability to focus, here are some applicable tips on how to help your child focus their energy and decrease their emotional breakdowns that happen out of frustration. Tell them that you understand that it is a challenge for them and that you are on their team to help them be successful. No child wants to feel like they are “bad” or that they are letting you down. I know you especially don’t want them to feel like they aren’t smart enough or capable of doing their homework. Simple words of encouragement like, “you are so smart, I know you can do this” can make a huge shift in their attitudes and make doing their homework more enjoyable. 2. Help them focus on their breath. Slow, deep breathing stimulates the parasympathetic nervous system and helps them calm down. This tip works so much better when you do it with them. Sit together and inhale through the nose slowly and exhale through the mouth slowly. Do this until you can see their body ease up and then give words of encouragement then go back to the task at hand. A great way to help your child focus is to take breaks to allow the brain to integrate the information and not get too overwhelmed with information. Often times, students lose focus because they get tired and bored. A great way to do that is have dance parties! Play your child’s favorite music and bust our your moves! Not only is it fun but movement is an excellent way to calm the nervous system. If dancing is not your thing, try yoga or stretching! However, the giggling often associated with dancing shifts everybody into a positive mood. Another brain break idea is to step outside and breath some fresh air. Allow your child to pick which brain break activity they would enjoy but make sure the activity is 15 mins max so it doesn’t completely shift the focus and make it harder for your child to recenter and complete their task after the brain break! Bonus tip: make your brain break healthy! It’s best not to make the break eating a sugary snack or watching tv. Those are stressors on the brain which make the nervous system stressed and is causing the focus issues in the first place. Movement, water and healthy snacks are great and set the brain up for success! The ultimate goal of school is to make lifelong learners and to allow them to explore how learning makes them happy and express their gifts. Therefore, it’s important that you watch your tone. If you set the stage that it will be a negative, hard experience then your child will sense that and it will be exactly that, negative and hard. But if you both start out positive and making the task at hand fun then there is greater chance that it will be a positive learning experience. 5. Learn your child’s learning style and foster that. There are many different learning styles! Visual, auditory, kinesthetic styles are a few examples and it is key that you find out which one your child learns the best with and use that! If your child learns the best by hearing and talking (auditory) about the assignment, writing it out may be difficulty and vice versa. Perhaps your child learns the best visually and pictures may be the most effective way for them. Focus on growing their strengths! If you don’t know which learning style your child thrives with, ask their teachers for insight; they will be happy to help you with this! As a pediatric chiropractor, I help your child focus and control their emotions by helping the brain build and grow those calm, organized and connected neural pathways versus the stressed and disorganized static neural pathways. The stream that is strongest will become the predominant part of the river right? Same thing with your child’s brain. This is achieved with very specific and gentle adjustments. These adjustments also help shift the body out of that sympathetic dominance or fight/flight state and into a parasympathetic or rest/digest/grow/learn state. 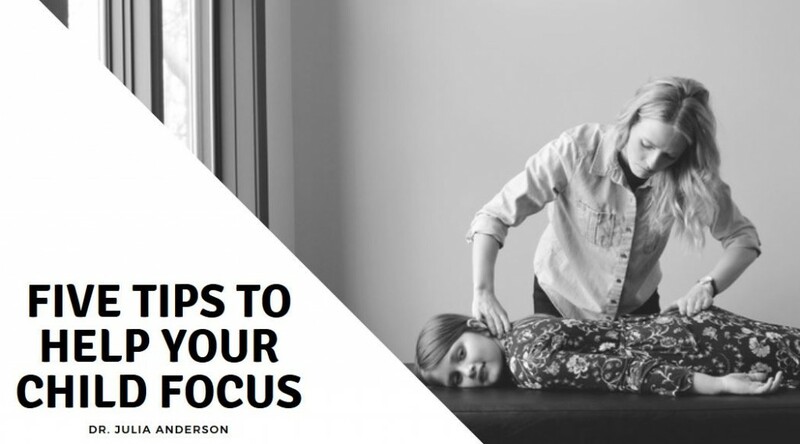 The tips listed above will help tremendously in the day-to-day struggles many families are facing but to experience lasting, life-changing results, you need to address and correct the cause of the disorganized nervous system and a pediatric chiropractor does just that. There have been countless, amazing results with kids being able to focus their energy and tap into their potential from within! We are not trying to dim your child’s light down or shut off their amazing energy but rather our goal is to allow your child’s gifts to be expressed by using their energy productively and our natural and neurological approach does just that. Once the static and stress is removed from your child’s brain and body, they can be the amazing and intelligent kids you know they are capable of! Find a pediatric chiropractor to help your child calm the stress within to allow your child focus and truly make this the best year yet!